Fr. Angelo S. Wildgoose was born on the island of Grand Bahama (Freeport) in the Bahamas. He is the second oldest of five children. He received all of his primary and secondary education while attending Catholic schools. His spiritual foundation was laid at Christ the King Anglican Church where he was baptized, confirmed, attended Sunday School, was involved in the Youth Group and served as an Acolyte where he eventually rose to the rank of MC. It was while attending Christ the King, that he felt a call to the priesthood. In 1995 at the age of 19, he was accepted into Codrington College Theological Seminary, Barbados. While in Barbados, Fr. Wildgoose was also enrolled at the University of the West Indies. In 1999, Fr. Wildgoose graduated from Codrington College with a diploma in Pastoral Studies as well as a BA in Theology from the University of the West Indies. He is also currently pursuing a Masters in Ministry Degree from Colorado Theological Seminary. On June 20th, 1999, he was ordained Deacon and was ordained Priest on September 21st 2000. He spent his early years in ministry at St. Margaret’s Anglican Church, where he served as the Assistant priest in charge of Youth development. He was also Rector of St. Patrick’s Parish on the island of Eleuthera, where he was also a teacher of Religious Knowledge at Central Eleuthera High School. During his ministry in the Bahamas he also served as assistant Priest of St. Matthew’s Nassau. While serving in the Bahamas, he obtained a Diploma in Secondary Education in the area of Religious studies from the College of the Bahamas, and became a trained and certified teacher. Fr. Wildgoose and his family left the Bahamas in 2004, where they have since served in the Diocese of Bermuda as Associate Priest in the Anglican Parish of Pembroke, the Diocese of Tennessee as Vicar of St. Anselm’s Episcopal Church, the Diocese of Pennsylvania as the Assistant Rector of The African Episcopal Church of St. Thomas, and now in the Diocese of New Jersey where he serves as the fourteenth Rector of St. Mark’s Episcopal Church, Plainfield. He has served on Diocesan Council in the Diocese of Pennsylvania, as part of the design team for the S.O.U.L. 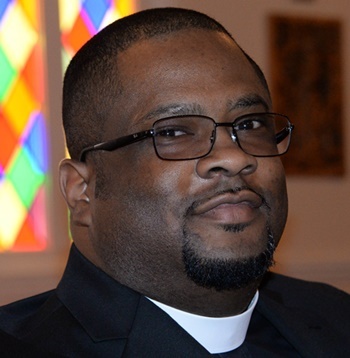 conference put on by the Office of Black Ministries of the Episcopal Church for the past two years, and has served in various positions involving youth and other ministries during the course of his ministry. While in the Bahamas, he met and married his beautiful wife Tonya (nee Lynch) on December 1st, 2001. Fr. Wildgoose and Tonya added to their family 2002 and 2007 with the births of Aaron and Anya respectively.